We continue our video series on how to Zazen, and how to allow the thoughts and emotions that appear during Zazen to drift from mind. A classic Zen analogy is clouds (of thought and emotions) drifting in and out of a clear, blue spacious sky (a mind open and clear of thoughts). 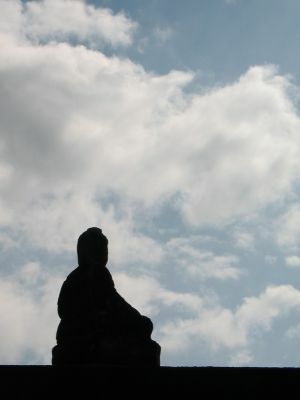 Our mind in Zazen may be compared to the sky; We are open, clear, spacious, boundless, bright, like the clear blue sky … Our attention is focused on everything and nothing in particular, just as the sky covers all the world without discrimination … Thoughts, like clouds, often come and go. Clouds drift in and out, that is natural. However, we bring our attention again and again (10,000 times and 10,000 times again) to the open, blue sky between, allowing the clouds of thought to drift away. More clouds will come, and so we repeat the process endlessly, once more and once more bringing our attention back to the blue sky … to the open spaces between thoughts. We do not try to “silence the thoughts forcefully” in Shikantaza. It is more that we allow the thoughts that naturally drift into mind to naturally drift out of mind, much as clouds naturally drift in and out of a clear blue sky. In this way, return again and again to the open, clear blue sky. Although we seek to appreciate the blue, open sky between the clouds, we do not resent or despise the clouds of thought that drift through our mind. We are not disturbed by them, we do not actively chase them out, neither do we welcome them, focus on them, play with them or stir them up. We allow them to pass, and return our focus once more to the quiet blue. 10,000 times and 10,000 times again. As in the real sky, both blue expanse and clouds are at home there. We should reject neither, not think the blue somehow “truer” than the clouds. In fact, some days will be very cloudy, some days totally blue … both are fine. We never say “this cloudy day is not good because there is no blue sky today.” When the sky is blue and empty, let it be so. When the sky is cloudy, our mind filled with thoughts, let it be so. You see, even when hidden by clouds, the blue is there all along. Both the blue sky and the clouds are the sky … do not seek to break up the sky by rejecting any part of it. (In other words, do not think one good and the other bad). WE DO NOT SEEK TO BREAK UP OR RESIST ANY PART OF THE SKY, CLOUDS OR BLUE… It is all the unbroken sky. Nonetheless, though we reject neither, we allow the clouds to drift from mind and return our attention again and again to the blue. We turn away from allowing ourselves to be lost in the blinding or storming clouds. Throughout, we are awake, aware and alert, conscious and present… we are not in some mysterious or extreme state. Nor are we dull, feeling lifeless or listless, for we should feel as illuminated, vibrant, boundless and all encompassing as the open sky itself. The clouds of thought and the clear blue are not two, are simultaneously functioning and whole … a single sky. This is our way in ‘Just Sitting’ Shikantaza Zazen. When you see the clouds, be as if you are thereby seeing the clouds as blue. When you see the blue, you may also see the blue as clouds. In fact, as you advance in this practice, you will find that the blue sky illuminates, shines through the clouds … is the very enlightening lightness of floating clouds themselves ... and we can come to experience both together… both thoughts and silence… as one. Last edited by Jundo; 11-07-2016 at 04:49 AM. Last edited by Jundo; 11-08-2016 at 02:32 AM.